What is going on in Southern Alberta? In 2005, the Lethbridge league had folded due to poor management and it looked like Roller Hockey had ended forever in Southern Alberta. In the peak of 2005 the Lethbridge League had 450 players in U8 - Adult divisions. Three years ago Lethbridge organizer Dave Sehn brought Roller Hockey back to the south. For the past three years of the program he has pulled together two adult teams for a weekly drop-in program. Each of these seasons has been gaining more momentum and interest from the community. In April 2016 they sent their travel team to compete at the Alberta Mens Ice Breaker Tournament up in Edmonton. The group had a modest showing with a 1-3 record in the tournament. The last few years have proved that there is still a passion for Roller Hockey in southern Alberta. 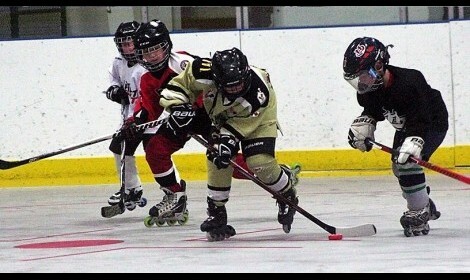 This year Lethbridge Roller Hockey is expanding its program to include youth teams. They will have 11 players in the U10-U12 age divisions participating in the program. There are plans to create a travel team from this group to compete in the U10 age group at the Recreational Tournament in Calgary. This is a great first step for any first-year youth program. If you know a community that wants to learn more about Roller Hockey contact AMRHA and a clinic can be setup to learn to play, mini tournament or send information about the sport to your community.